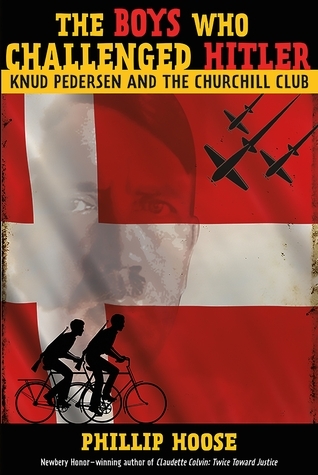 The Boys Who Challenged Hitler: Knud Petersen and the Churchill Club by Phillip Hoose. Grades 7+ Farrar, Strauss & Giroux, May 2015. 208 pages. Reviewed from ARC provided by publisher. During WWII, in 1940, Germany took control of Denmark. The Nazis basically seized Denmark and called it their "protectorate"and the government of Denmark said, "Okay." They rolled over and let Germany take over. Now, in Norway when Germany tried to take control, they fought back against the invading soldiers. And they didn't win, but they at least took a stand. But the government of Denmark didn't want to risk its citizens' lives, so they didn't resist. And this made some Danish people very angry. One of these people was Knud Peterson. He was fourteen years old when Germany took over and he thought that was garbage. He looked at Norway's response and thought Well, at least they stood up for themselves! They let the Nazis know that they were not okay with occupation! But the adults in charge had let Germany in. And Knud was just a teenager. What could he do? It turns out, he could do a whole lot. He and his brother Jens got together some like-minded classmates and they decided that they would start a resistance movement. They would do whatever they could to stop or slow down the Nazi soldiers. At first, they did things like messing with the German directional signs that told soldiers where to go and defacing German property and the property of known Nazi sympathizers with their symbol of the resistance movement. As their ranks grew and they became more experienced, they seized German weapons and set fire to buildings and railcars. They called themselves The Churchill Club. They awakened the nation of Denmark. They started the resistance movement. And all before they graduated high school. This is a gripping true adventure story that will have wide appeal with kids. Much of the story is told in Knud Petersen's own words, collected through hours of interview and hundreds of emails, which gives the book an authentic voice and brings the reader right into the action. And the action is nonstop. These brave kids had a fire in their hearts and they would stop at nothing to save their country from the Nazi invasion. This story is truly a testament to the power of teens to make a difference in their world and this is an engaging and inspirational story that needs to be widely read. Hoose follows Knud's story through the formation of the Churchill Club to their eventual arrest and the aftermath in the later years of the war. Archival photographs and documents throughout the book help bring the time period and events to vivid life. Back matter includes an epilogue, detailing life for the players after the war, an extensive bibliography, and source notes. WWII books are popular anyway, but this story featuring actual teenagers performing extraordinary acts of courage is a sure winner. Don't miss it. For another gripping nonfiction book about courage and resistance in the face of oppression, pick up Steve Sheinkin's excellent The Port Chicago 50, also set during WWII but on the American homefront. Readers interested in learning more about the actions of youth during WWII may like Hitler Youth: Growing Up in Hitler's Shadow by Susan Campbell Bartoletti. Those interested in more stories of resistance during WWII may like Beyond Courage: The Untold Story of Jewish Resistance During the Holocaust by Doreen Rappaport or the historical novel Shadow on the Mountain by Margi Preus.